The wisdom of Three’s new Sunday night movie strategy — playing female-skewed titles after Married at First Sight NZ — will need revising after TVNZ 2 pummelled Me Before You with Jack Reacher: Never Go Back. 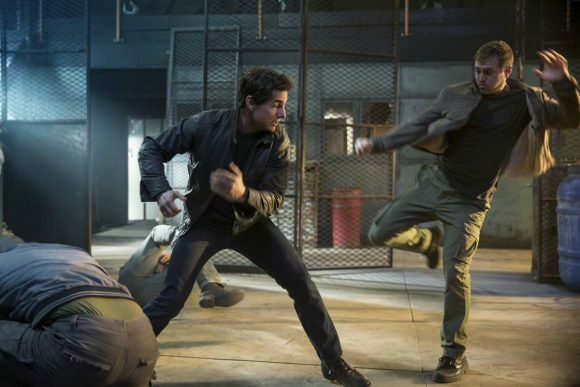 The Tom Cruise sequel won its slot in all the core commercial demographics on Sunday. It averaged 5.4% of TVNZ 2’s target demo, 18-49, 7.0% of 25-54 and 3.5% of 18-39. Three’s movie averaged 2.7% – 4.3% in the same demos while TVNZ 1’s Vanity Fair averaged 1.3% – 2.5%. Earlier, TVNZ 2 dominated with Shortland Street at 7.00, which won its slot in all the key demos, although TVNZ 1’s Hyundai Country Calendar was competitive in the 25-54 and 18-49 stakes. From 7.30, MAFS edged out My Kitchen Rules NZ with 5.9% of 25-54 (vs 5.1%), 4.5% of 18-49 (vs 4.2%), 3.6% of 18-39 (vs 3.4%) and 7.4% 0f household shoppers with kids (vs 6.5%). But it wasn’t enough to stop TVNZ 2 winning the night in all the core demos. The network also dominated Saturday night with its movies Raising Helen and The Da Vinci Code. TVNZ 1 won the early part of the night with 25-54s, when MasterChef Australia ruled with 5.6%, while Three’s America’s Got Talent double-episode finished third, averaging 3.5% ahead of Taylor Swift: Road to Redemption’s 2.0%. Prime’s new-look line-up of classic Whose Line Is It, Anyway, QI and The Coroner couldn’t average higher than 0.8% of 25-54 while Sky Sport 2’s International Rugby League coverage averaged 4.8%. Not surprised about Prime, 30 year old programming (Whose Line is it Anyway?) just doesn’t cut it. SD and 4:3 … I get the feeling Sky are running the channel into the ground … feels like Four (and TV4) before that was reformatted (both times). I wonder what will happen if the rumour turns out to be true? Interesting – something needs to happen with Sky. After decades of a monopoly, they are seeing their position slip as people seek more cost effective, quality focussed and individually controlled viewing. I’ll sit back and watch this one. On unrelated topics, Phil, have you got any contacts at Netflix? If so, can you quiz them on their pricing structure? I have a 4K TV, I want to watch their shows in 4K, so why can’t I have a 1 x 4K subscription? If I want to watch 4K, I have to buy a subscription for 4 x 4K subscriptions. Right now, I couldn’t watch 4 x 4K subscriptions and I wouldn’t want to (perhaps when the kids are older and they have their own TVs etc), but why can’t their subscriptions be more customisable and you can pick the number of screens you want and the level of HD – either standard HD or 4K. Buying 4 x 4K screens seems a waste of money and ‘capacity’, you know? I’m sure a simple change to the “change plan” screen on the Netflix account page and this would be sorted – seems a bit lazy and un-customer focussed?! Sorry, Rosco, but not a lot separates Netflix and Sky when it comes to maximising their market clout. I agree with you re the 4K pricing strategy — it’s a rort designed to exploit the desire of 4K TV owners to see (and hear) their content in higher definition, just like Sky does with its HD Ticket charge. However, Sky offers only a relative handful of HD channels whereas Netflix’s 4K library is expanding rapidly and while the cost of 4K admission might be overpriced and inflexible compared to the SD and HD plans, the quality and quantity are impressive. I prefer Amazon Prime’s model, where the subscription cost is the same regardless of format. But its library is far inferior and it doesn’t offer 4K extras like Dolby Vision and Dolby Atmos (only HDR 10+ and it’s not clear which shows it streams in this format). So at least Netflix can argue it’s investing in providing the best possible experience for subscribers. While I think 4K subscribers are unfairly subsidising too much of it, Netflix does offer a choice of SD, HD and 4K plans whereas Lightbox maxes out at 1080p. Hi Phil, Thanks for your thoughts on this one. Don’t think for a second I’m a fan of Sky, there are many things I dislike about that company, but that’s a whole other rant-y post on its own! 🙂 I fully agree Netflix seem to have embraced the quality of their offerings, a competitive price point, and leaving it to the customer what to watch and when they want (something Sky should look more closely at perhaps?). Netflix have a global presence and lowly old Sky NZ can’t compete at this level – their subscribers are falling and price increasing. But as you say, for what you get with Netflix, the 4K price you can argue is live-able with!